MITZPE RAMON, ISRAEL–After today’s work near Makhtesh Ramon, our fieldwork is over for this season. This evening I pack up our collections in my luggage, have a last dinner with Yoav and his family in their desert home, and then get some sleep before a very early departure tomorrow morning. I am looking forward to returning soon with Wooster Independent Study students to continue our work in the Mesozoic rocks of southern Israel. A Bronze Age tumulus (rock-covered grave) at the top of a hill north of Makhtesh Ramon. MAKHTESH RAMON, ISRAEL–On my last day of fieldwork Yoav took me to some wonderfully complex exposures of Cretaceous and Tertiary rocks just north of Makhtesh Ramon. They tell a story of the origins of the Makhtesh anticlinal structure, especially the date it appeared and whether it was ever exposed as an island before its center was eroded away. Part of the debate comes down to the depth at which certain Santonian (Cretaceous) sediments were deposited. These sediments contain oysters and exquisite shark’s teeth. We collected a nice set (see below) which I will attempt to identify to see if we can use what we may know about these sharks to determine the depth of deposition. 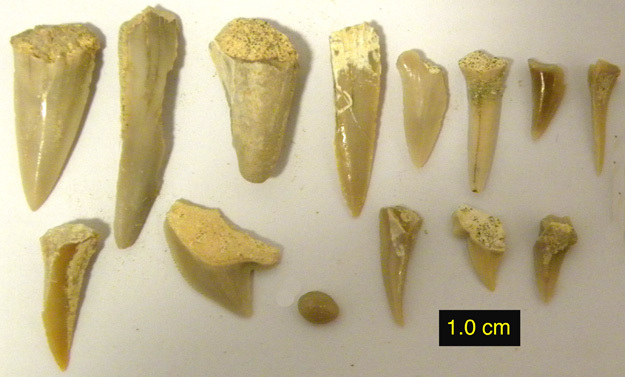 Cretaceous shark teeth collected from just north of Makhtesh Ramon (N30.56235°, E34.64876°). 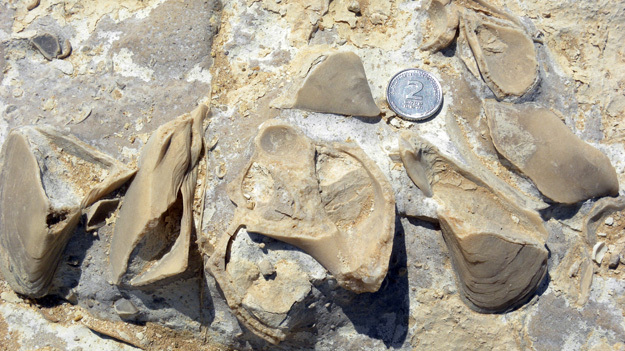 Another indication of how shallow the seas were in the Middle Jurassic of southern Israel. This bedding plane in the Matmor Formation of Makhtesh Gadol has a gastropod (snail) fossil in the center of the image surrounded by angular shells of fossil mytilids (clams commonly called mussels today). In life the mytilids had attached to the gastropod and each other by fine yet strong byssal thread produced by a special gland. This kind of relationship is very common in tidal pools and other shallow areas where wave action is strong. Vertical fault (at the hammer head) in the Matmor Formation, Makhtesh Gadol, Israel. Most of the faults are vertical and more or less east-west trending. After mapping them, the fun part was working out how much displacement took place and when. 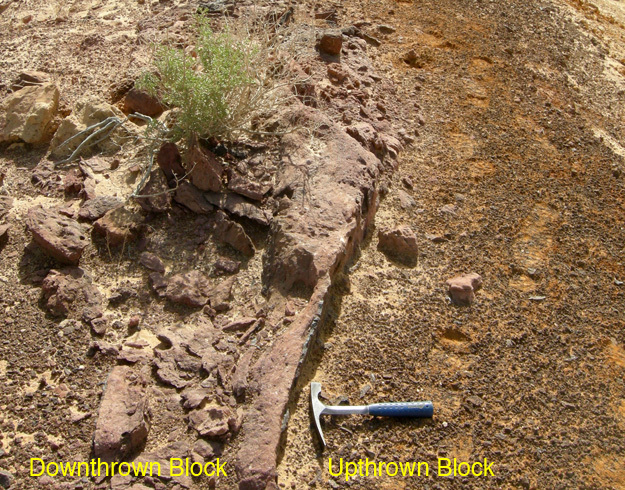 For example, using a Lower Cretaceous laterite as a key horizon, we could tell on one segment of a fault that 6.5 meters of displacement was prior to laterite formation and 4.5 meters came after the laterite. This could only be done after the stratigraphy of the Jurassic units under the laterite was described, which is Wooster’s contribution to this structural analysis.